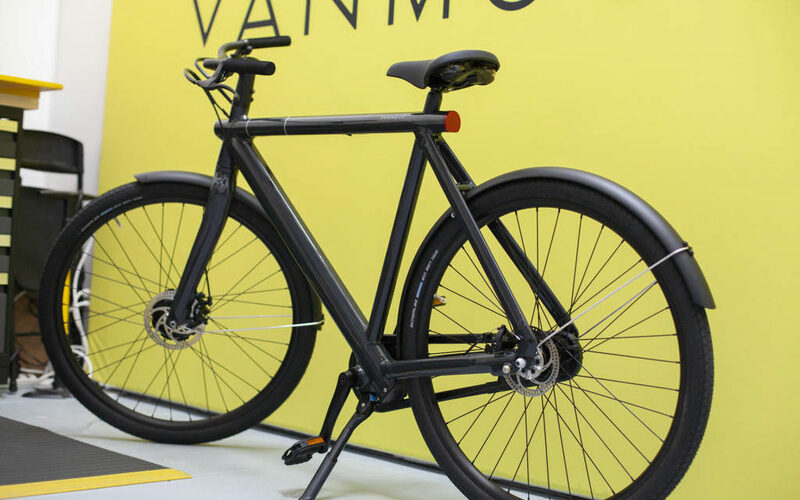 The Vanmoof Electrified S2 at the company’s new Valencia street store. Photo by Abraham Rodriguez. Valencia Street, which has long featured twee knit cozies over the bike racks, will now feature a shop hawking $3,400 Vanmoof bikes to park on them. Dutch company Vanmoof wants to capitalize on this city’s bicycle culture by opening its first West Coast outlet peddling its high-tech bikes. Vanmoof offers two types of bicycles: regular and extra-strength, so to speak. The Smart S and the Smart X models are pedal-powered — but with built-in features that you can control with a smartphone. Users can immobilize their bike’s wheels via an app, set burglar alarms and even track it over GPS. The company has so much faith in its GPS technology that it promises to give you a new bike if your stolen one can’t be located within weeks. But the battery-powered S2 and X2 models offer all of those smart goodies and more: They come with an efficient electric motor in the front hub that assists cyclists. The battery is located in the bar under the seat, and charges in about four hours. Before Vanmoof’s Oct. 3 grand opening at 886 Valencia St., corporate staff invited this reporter out for a joy ride. Daan Rekker, the company’s Director of U.S. Operations, unveiled the company’s magnum opus, the new Electrified S2. It resembles a sleek road bike with thick wheels, offered in Fog White and Thunder Grey and only available for preorders. The Dutch bike is produced in a variety of size options: The X2 is aimed for those of us shorter than 5-foot-7, and the S2 is for the giants of the low countries standing up to 6-foot-8. Rekker blushes. “We’re very tall in Amsterdam,” he said. (The Dutch are, on average, the world’s tallest people — but Rekker, like this reporter, seems to be about five and a half feet tall). As fate would have it, yours truly was given one of the smaller bikes, given that the Electrified S2 is still in prototype form. A spectacular crash on Valencia Street would make for great copy, but Vanmoof would prefer to avoid underwriting such a misadventure. We trekked southward on Valencia, parading between other pedal-powered bikes, eScooters and boosted skateboards. A boost button on the bike’s handlebar kicks things into overdrive, and after hitting it you’re rewarded with a satisfying electrical whine and a mounting amount of torque. That’s the advantage of electric motors; they have an incredible amount of torque for the size. You won’t go to plaid, but the velocity is just under ludicrous speed for a pedal bike. At least for an average rider on a busy two-lane street. Users can modulate the amount of pedal assistance in four different settings: Setting the power assist to “1” will offer only 25 percent assistance to accentuate your own pedaling, yet setting it to “4” will boost a rider’s motor assistance up to 80 percent. Vanmoof execs claim their electronic bikes can reach up to 19 miles an hour — any faster than that and state regulations would limit where they could be ridden — and have a range between 37 miles to 93 miles for the electrified S2 and X2 models. Rekker stops on 23rd and Valencia, where we spot a hill to the west. “These are really handy for climbing uphill,” he says as he pats his space-black bike. We try them out on a nice ascent, and it did, indeed, make a difference. Rekker said that the company’s ambitious goal is to get the one billion people out of automobiles and help them into the bicycle lanes. “We wanted to tackle a lot of inconveniences which usually make people not want to bike,” Rekker said. 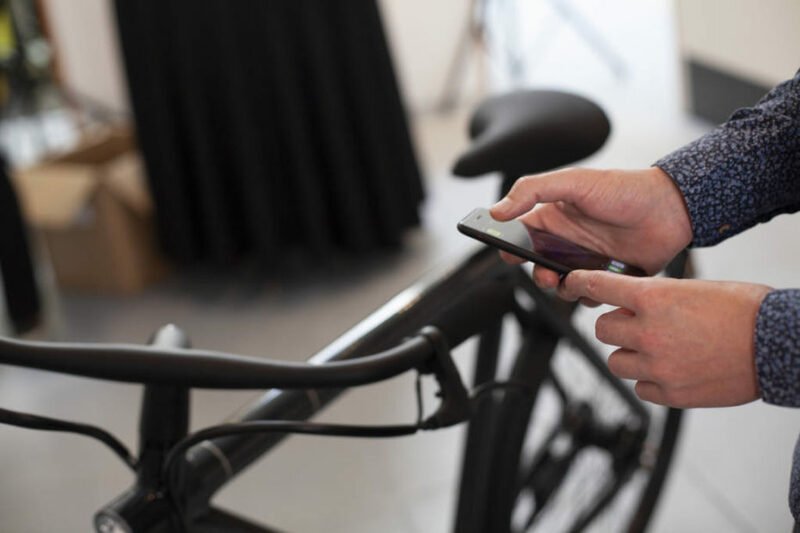 Vanmoof’s bicycles feature a smartphone activated safety locks to prevent theft, and even GPS tracking. Photo by Abraham Rodriguez. A chief complaint among San Franciscans is the constant bicycle theft. Vanmoof figured that one out by adding GPS tracking to the bicycle’s anti-theft software. Vanmoof employs a team of bicycle trackers deployed across the world in search of stolen Vanmoof bikes. Among one of the stories they shared was of a rider who had his bike stolen in Germany — which, a week later, was recovered by the bicycle recovery team thousands of miles away, in Ukraine. The same thing happened to one unlucky Parisian who had his bicycle stolen in the City of Love. It was eventually located across the Mediterranean, in Morocco. This manner of customer service doesn’t come cheap, however. The Electric S2’s price is listed at a hefty $3,398, but an early-bird discount of 24 percent will leave shoppers with a final price tag of $2,598. 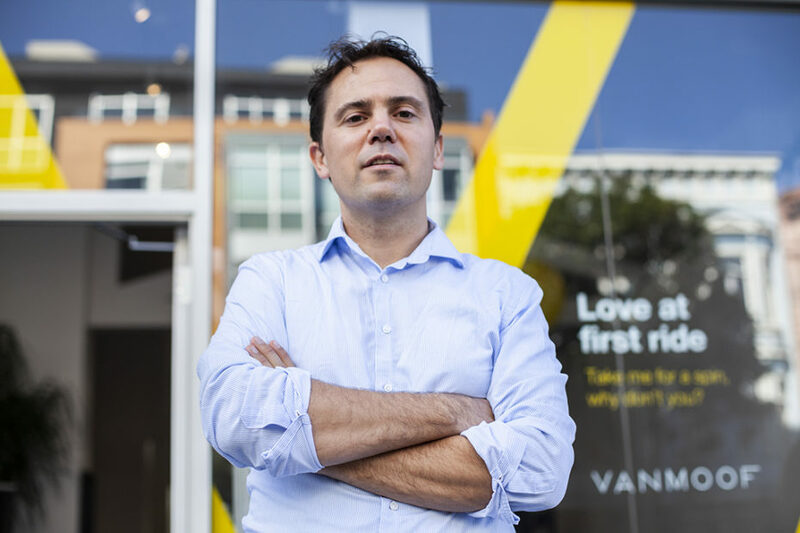 The Valencia store’s opening was headlined by one of the company’s co-founders, Taco Carlier (he assures us this is a traditional first name in the Netherlands). He and his brother, Ties Carlier, this week launched four stores — in London, Paris, Tokyo and here — and had just flown in from Paris. Vanmoof Co-Founder Taco Carlier, outside of the Valencia store. Photo by Abraham Rodriguez. Outside on the sidewalk, Taco Carlier was prepping himself to take one of the Electric S2’s for a shopping run. He had just arrived in the city and needed to go buy a new shirt for the store’s opening. “We always wanted to open a store here,” he said. 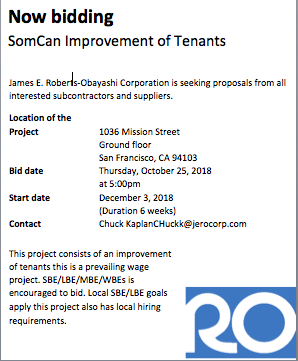 And off he went, the proprietor of the most expensive Taco shop in the Mission. Actually, in California you can use ebikes going up to 28mph and still use bike lanes. The 20mph restriction is true in Europe and some states here, but they’re not being honest when they make it seem like this the fastest that’s allowed, and the low speed is actually the dealbreaker for me on this otherwise fine bike. I’ll take a look if they ever release a proper class 3 speed pedelec. • Good grief, there’s nothing “twee” about yarnbombing bike racks. Why the pointless sideswipe at a quirky D.I.Y. practice?